Cliff Mass Weather and Climate Blog: Olympic Snowpack is 39,100 Percent of Normal! Olympic Snowpack is 39,100 Percent of Normal! I took a look at the latest snowpack report today and was stunned! Most of the snowpack measurements in Washington were 200 to 600% of normal, and Oregon and Idaho had similar values--some into the thousands of % of normal. Montana has several basins into the thousands. Now having snowpacks tens or hundreds of times normal does not mean we had tens or hundreds of times more rain or snow last winter; normally there is very little snowpack left this late in the season and thus having a substantial snowpack can give you very large numbers (where snow is usually melted off completely you could get infinity!). But no matter how you cut it, we have an amazing snowpack for this late in the season. Only a a handful of days got above normal and most never even got close to the normal highs. On many days the high temperatures barely reached the average lows! This kind of substantial late season snowpack provides a serious flooding risk, so it is good that we are not warming up quickly. 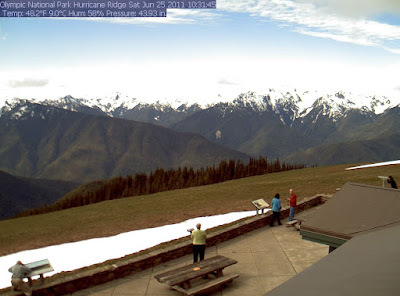 A major heat wave situation would cause a number of rivers to overflow their banks--particularly overthe eastern slopes of the Cascades. I should note that the northern Rockies have a huge snowpack as well and the melting of that snow is resulting in historic flooding over the Dakotas right now. We should not forget that the large number of dams on the Columbia not only provide hydroelectric power and water for irrigation, but they serve a flood control role. This week I was talking to a meteorologist at the Bonneville Power Administration and he said that their calculations indicated that without the dams, Portland would have had substantial flooding starting two weeks ago. 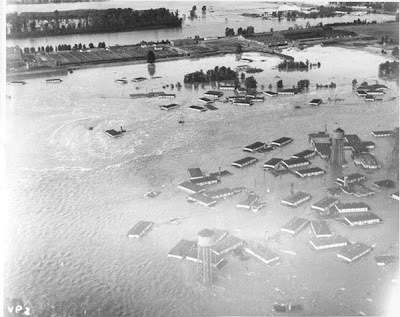 Before the dams went in, major springtime floods were not unusual on the Columbia. 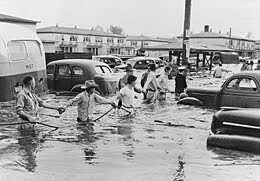 The most dramatic example was the Vanport, Oregon flooding in 1948. So we should hope for a slow warm up--and there will be plenty of water for irrigation and hydroelectric generation this summer. while the eastern part of the state is warmer and sunny. Cool air is associated with high pressure, warm air with low pressure--and thus we have a large difference in pressure across the Cascades. Air rushes through the Columbia Gorge and through gaps in the Cascades, right into the major windfarm projects. Thus, this is a very good year for wind power as well. The problem, as discussed in the press, is that there is not enough transmission capacity for all this clean, renewable power, and as as result the wind farm folks have been forced to feather their turbines, losing large amounts of money in the process. Not good for wind farm owners, probably really good for lawyers. Cliff, I'm not suggesting that this IS happening, nor that it will, but I am posing a serious question formed entirely from lack of information. The question is, in many words, I always labored under the belief that ice ages owed to "cold" in the sense of cold springs and summers, and colder autumns and winters. But is it possible, maybe even just in part, that a small shift in climate, such as we're witnessing right now in our region, but for a decade and longer, could result in the accumulation of snow sufficient to build glaciers, and then ice fields, and advancing ice? Does it really take an extreme shift in weather to make an ice age, or can an ice age over areas of our hemisphere be the result of "cooler" late springs with late snowfall, some of which at elevation survives owing to greater cloud cover and somewhat cooler temperatures. Eventually of course, if snow does survive, then more sunlight is reflected which could act to increase additional accumulation, but that's a separate issue from my basic pondering. And the floods we're witnessing, while historically large relative to modern humanity, are nothing compared to those in the Northwest in geologic time. Could those events have some basis in similar, "late snow accumulations" melted by subsequent "hot(ter)" summer sun? Being the novice I pose that I'm the student not afraid to ask a question even at the risk of it being a foolish question. Absolutely typical for wind power: lots when you don't need it, bupkis when you do. You provide such good info on weather - I find myself often recommending your blog. But would you please consider adding an "about" section? It would add credibility. People have suggest you may not know what you are writing about - "what id he's just a student... etc". I read every post even though I'm at the edge of your forecasts. I'll help answer your questions, to which Prof. Mass can add if he sees fit. 1. Your thinking is on the right track. Glaciers move slow enough that we humans often perceive them as static, when in fact there are in constant flux. They are a visual representation of a balance between several different variables in the climate. (as a side note, they all have varying degrees of lag in that representation). As they are always changing, then yes, you are thinking along the correct lines. Gradual, rather than extreme, change in summer and winter weather can work together to significantly change the size of glaciers. Feedback loops (like the albedo affect you mentioned) can reinforce change in the cooling/advancing direction. There are also counteractive forces though, that tend to limit glaciers from advancing, say, all the way down into the Puget Sound. You need global change rather than local climate change to affect an ice age. 2. The geologic floods you reference are most likely the Glacial Lake Missoula outburst floods . These repeating floods were caused by an ice dam rather than seasonal weather. I encourage you to read about these floods, as they are one of the more sensational stories in earth's history. Weekend Podcat and Who is a Meteorologist? Out of the Refrigerator into the Frying Pan!